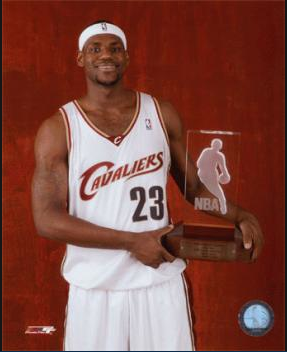 During the 2003-2004 season, James made history, becoming the first member of the Cavalier franchise to win the NBA Rookie of the Year award. He was also the youngest player ever at only 20 years oldto receive this honor. Averaging 20 points per game, James was one of three rookies to accomplish this feat, putting him in the same company as Michael Jordan and Oscar Robertson. Listed as a small forward, James has set numerous youngest player records since joining the league. He was named the NBA Rookie of the Year in 2003–04, NBA Most Valuable Player in 2008–09 and 2009–10, and has been both All-NBA and an All-Star every season since 2005.